MANHATTAN — Cinco de Mayo is less than a week away, and for those looking to cook up a celebration of Mexican heritage, DNAinfo New York can help. We've collected recipes from some of the best Mexican restaurants across the five boroughs, presenting a dish each day that you can prepare for Cinco de Mayo weekend — from fabulous flan to sweet sangria. 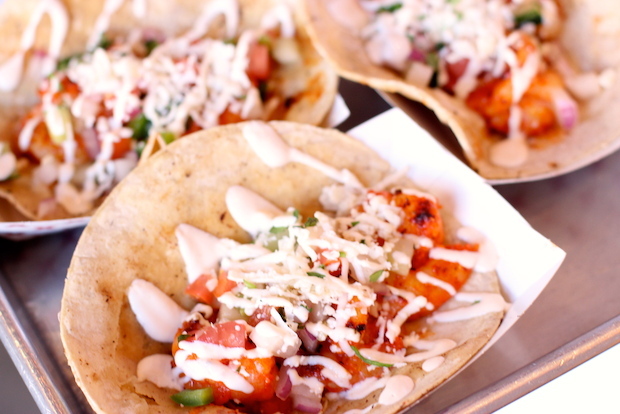 A taco truck that roams Manhattan mixes the flavors of Korea and Mexico. The combination is not as odd as it sounds, insists Kimchi Grill and Taco Truck director Tina Chiu-Maes. "Both Mexicans and Koreans are huge spice lovers," she said. For Cinco de Mayo, Mike Calderon, the chef at Kimchi, has created a recipe that combines shrimp in a fiery marinade that's made with the staple Korean condiment gochujang (a fermented hot pepper paste). The entree is topped with tequila salsa. Here's a DIY guide for spice-loving revelers who either aren't near Kimchi's taco truck or can't reach the popular restaurant at 766 Washington Ave., in Prospect Heights. 1. Mix shrimp marinade ingredients well. 2. Add marinade to shrimp. 3. Marinate four to six hours or overnight. 4. Add oil to griddle or pan. 5. Sear shrimp on griddle or sauté. 6. Add salsa ingredients in a bowl and mix well. Salt and pepper to taste. 7. Wrap shrimp with tortillas. Top with tequila salsa and sprinkle with queso blanco cheese.